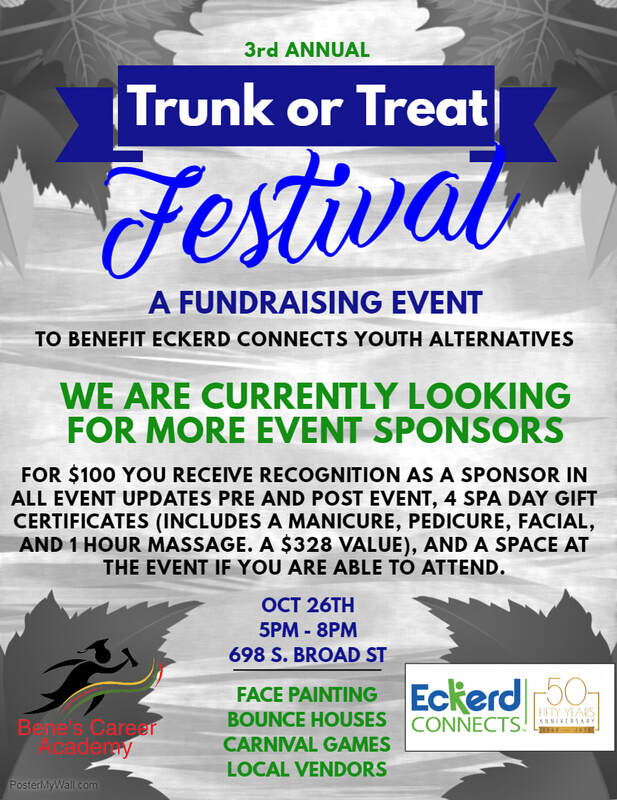 So what is trunk or treat? This evening allows a way for families to take their children to have fun in a safe environment. By closing down our parking lot and lining up the decorated cars and trucks of our students, employees, friends, family, and community we allow kids of all ages the opportunity to trick our treat from trunk to trunk. Thats not it though, we also have bounce houses, concessions, games, a window contest, and our local vendors always have great activities, giveaways, and goods for sale as well. All of this fun and to top it off, ALL of the profits go to a great cause. This year that cause is Eckerd Connects. They have a girls camp called Camp E-Nini-Hassee in Citrus County. For adolescent girls who are having emotional or behavioral difficulties, Eckerd Connects’ E-Nini-Hassee Outdoor Therapeutic School for Girls delivers fully-accredited education and counseling services in a therapeutic outdoor environment that fosters personal growth. E-Nini-Hassee was founded in 1969 by Jack and Ruth Eckerd as the first outdoor therapeutic program for troubled girls in the southeast. At E-Nini-Hassee, the Eckerds created a positive, strength-based environment for girls ages 12-18 to experience nurturing guidance. Students are able to see adults role modeling appropriate behaviors, learn in an educational setting with passionate teachers and participate in therapeutic outdoor adventures during their time at the school. E-Nini-Hassee helps girls fully realize the potential that already exists within them. ** $10 off 10x10 vendor spot for Hernando County Chamber of Commerce Members! The event will take place in the front parking lot of Brooks Plaza in Brooksville Fl. Home of our Brooksville Campus.